Tournevie offers courses (how to use certain tools), as well as workshops (how to build or shape objects). Most sessions take place in our workshop in Molenbeek. This is also the place where you can practice or carry out your own projects. Here’s a brief description of our courses and workshops. Check out the calendar below for more information, time & dates, and how to subscribe. Come in and meet Hugh, our workshop manager, and some of the workshop instructors. A full range of tools available to workshop users will be explained. Complete your workshop training with this course, which teaches safe and efficient use of three more essential woodworking machines. There is a lot more to making a round hole than many think! This training covers drilling in metal, wood and stone and placing bolts, screws and plugs. 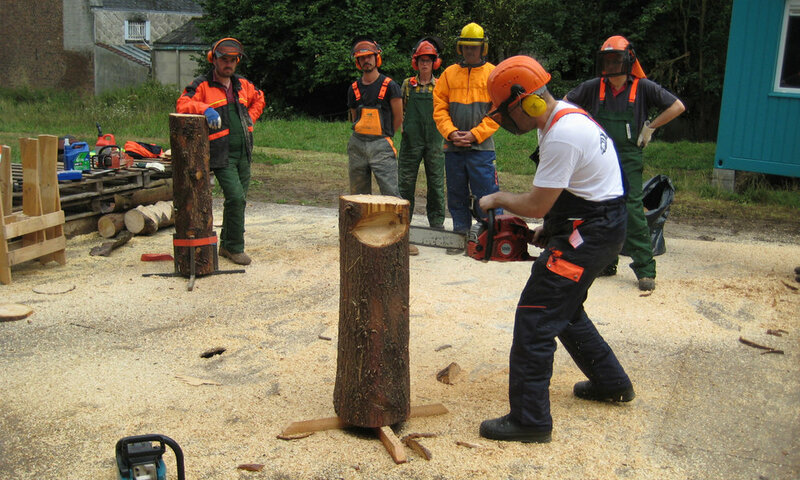 Many would like to have a go with a chain saw, but few people actually know how to use it properly. In this course, we teach how to keep you from lopping of an arm or a leg. This introduction reveals the theory behind welding and how metal and heat interact. You’ll discover a number of different welding techniques. The table saw is an essential power tool, but also dangerous for inexperienced users. This course teaches you how to safely unlock the full potential of this powerful machine. Over the course of 4 afternoons, our instructor will take you through the essential steps of furniture making, from design to final assembly, in this case of a wooden stool. A course or workshop you’re interested in isn’t scheduled at the moment? Let us know by mail which session you’d like to attend. We’ll contact you when a new session is planned. After a successful career in information technology Jan founded Atelier Vilvoorde, one of the first Maker Spaces in Belgium. Jan loves to teach and has developed several trainings in woodworking, 3D-design, laser-cutting. analog- and digital electronics. He takes care of our courses related to woodworking (tools). Hugh is from Ireland and lives in Brussels. He is a hobbyist woodworker, and has worked as a technical director in performing and visual arts (whatever that means) for the past 12 years. You will find Hugh manning our workshop space. Get in touch with him if you want advise on a specific project. With a decade as a Makita product specialist under his belt, Thomas can name each single part of a hammer drill in Latin. He divides his time between iFixit, Tournevie, renovating his house, and answering a myriad of questions from his two lovely kids (by now, his wife knows better than to get him started).